Based in Olney, Buckinghamshire, only 5 miles from Aston Martin's factory in Newport Pagnell, we are an Aston Martin specialist in the true sense of the word. The company was founded by Desmond Smail in 1981 and specialises in sales, service and restoration of post-1958 Aston Martins. 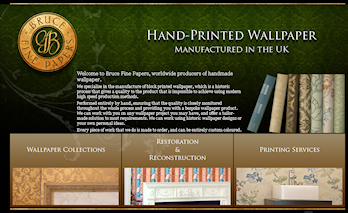 Alan Bruce of Bruce Fine Papers is a specialist manufacturer of block printed wallpaper. Employing historic processes that gives a quality to the product that is impossible to achieve using modern high speed production methods.Performed entirely by hand, ensuring that the quality is closely monitored throughout the whole process and providing a bespoke wallpaper product. He will work with you on any wallpaper project you may have and offer a tailor-made solution to most requirements. Alan can work using historic wallpaper designs or your own personal ideas. Every piece of work is made to order and can be entirely custom coloured.